Which Types of Rooms Do Wall Units Work Best in? The contemporary wall unit is just what the architectural doctor ordered at a time when most people have more ‘stuff’ than ever before. Some of that stuff will do just fine being stored in a box in the attic but some of it is a part of your daily life and/or it embodies your tastes and beliefs as well as signifying connections to those who matter. Wall units in Toronto can be custom made to fit any decor, room size or function. But as versatile and important as they are they’re not always appropriate in every room. Below we’re going to look at which type of room a wall unit will work best in. ● The Living Room – This is no surprise since just about everyone knows at least one person who has a wall unit in their living room. The contemporary wall unit is a great way to both reduce clutter from DVDs, video game cartridges, consoles and magazines while at the same time featuring family heirlooms and art objects. They also play host to the flat screen TV which can be hidden discreetly behind sliding or folding doors if you wish. ● The Bedroom – Wall units in the bedroom are a smart way to organize shirts, socks and undergarments. A bedroom wall unit also makes a great place to store linens, bath towels and the like. And you can use it to store shoes if you’ve run out of space in the closet. Like the living room wall unit the bedroom unit can also host the TV. ● The Finished Basement – Finished basements are often used as recreation rooms where family and friends go to watch sporting events, play pool and even play old fashioned games from time to time. As such these room tend to be clutter magnets and a wall unit is a great way to stay ahead of the onslaught of game cartridges, VR headsets, old school board games and more. “But what about the kitchen?” you ask. Well here’s the thing. The kitchen already has its own form of wall units; they’re called kitchen cabinets. Which means the kitchen has been out in front on this type of decor element for centuries. It’s really the other rooms of the house that are catching up to the practical advantage having wall-based storage. 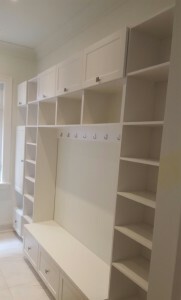 Wall units in Toronto are an excellent way to obtain the extra storage you need for just about anything. They also provide any room they’re in with a focal point. Give Superior Closets a call on 905-669-8280 to find out how one of our wall units can help bring the disparate elements of your domestic life back into harmony. The demands of modern family life along with those of a busy career call for efficiency and organization. Taking advantage of innovative storage solutions in Toronto will no doubt provide for a less stressful home lifestyle, allowing you to spend more time on things that matter most to you. Toronto Storage Solutions – Why Are They So Important to Your Home? Abundant and well-designed storage space has become increasingly desirable. Below are some reasons why adding new storage to your home will benefit you and your family. Organization: We all know how fast-paced modern life can be. We also know that we live in a material-driven world. Staying organized allows you to maximize time spent on the most important aspects of your life, whether that be your family, career or both. Utilizing space in your home office, bedroom, bathroom and garage will help you stay on top of things without having to deal with messiness and clutter. Smart Interior Design: The comfort and design of your living space has a huge impact on the way you feel day-to-day. Your home should allow for relaxation while also providing the functionality you require. Superior Closets provides storage solutions in Toronto that efficiently utilize space without intruding on the interior design elements of your home. Increased Value to Your Home: Storage space has become more sought after by people looking to purchase or rent property. Adding fashionable and creative storage areas such as walk-in closets, cabinets and custom entertainment centers will only increase the value of your home and make it more desirable if it is ever on the market. Reduced Stress: The more mess there is, the more stress there is. Stress is a fact of life. If the things around you are in disarray, your stress level increases. A home with smart, well-made storage space will reduce stress by providing an easy way to stay organized and also keep things out of your way until you need them. “Out of sight, out of mind” isn’t always a bad thing. A Great Kitchen: One of the most important areas of the home is the kitchen. It’s also an area that is almost entirely comprised of storage space. Most of us have lived somewhere with poorly designed kitchens and know how frustrating it can be. Well-designed cabinets and pantry space add an ease of use to your kitchen and allow you to save time and enjoy the experience of cooking and entertaining guests. Save Money: When your home is cluttered and messy, you are more likely to either forget that you own something, or simply misplace it. When you can’t find the things you need, you may make costly and unnecessary purchases. Keeping track of what you have and where it’s located in your home will only save you money in the long run. It’s likely that you already know what areas would benefit from additional storage solutions in your Toronto home. However, you may not know the best approach to achieving that solution. Superior Closets can help by providing efficient and stylish storage options that will improve the look and functionality of your home. Contact us at 1-800-670-8666 or 905-669-8280 to discuss your options. Most of us are probably aware how quickly the mess in our closets can get out of hand. All of a sudden you find yourself searching for a shirt or a pair of shoes you recently wore and become frustrated because they’ve somehow disappeared. These aren’t things you want to spend time dealing with. Adding closet organizers to your Toronto home will likely provide surprising benefits. Below are some issues that closet organizers will help clear up. Staying Organized: The biggest problem in most closets is lack of organization. Many closets were not built with ample and creative storage space. Adding closet organizers will not only give you the opportunity to stay organized, but will also improve the look of your closet. You will then have the option to organize based on your specific needs. Separate work and casual clothes, incorporate labels and systematically organize shoes. You’ll find that by installing closet organizers, you will eliminate stress and frustration, save time, and feel better about the cleanliness of your space. Not Enough Closet Space: It’s amazing how quickly we accumulate things. Aside from clothing, closets are areas where we store things that we may only use occasionally, such as blankets, towels, linens and miscellaneous items. You may find your closet space disappearing quickly. Closet organizers will create additional space and allow you to store things you need, but don’t use all the time. Knowing where these items are and having quick and easy access to them will also save time and ease stress. Storing Out-of-Season Clothes: When the seasons change, so do our clothes. Storing out-of- season clothes is made much easier by utilizing closet organizers. Toronto winters can be harsh. When summer arrives, we need to move our bulky winter clothes out of the way. For many, this means stuffing them into unsightly boxes or simply moving them to the back of the closet. Closet organizers will provide an easy way to store out-of-season clothes without decreasing the space needed for in-season clothes. Unnecessary Spending: This may sound familiar – You misplace a piece of clothing or household item and purchase a replacement, only to find the original a week later. An organized closet is the best way to prevent this from happening. You may not realize it, but the peace of mind that an organized and aesthetically pleasing living space provides is invaluable. Don’t let an unorganized closet be the reason for unnecessary and costly expenditures. Sometimes the benefits that specific, small improvements can provide are not apparent to us until those improvements are made. Most of us don’t have time to think about our closets. You may be amazed at how much better you feel and how much time and money you save when your closets are organized. Wall Units: Should You Buy One? Modern wall units are designed to provide optimal functionality and classy design. They can be great additions to most rooms in your home. But how do you know if a wall unit is the right option for you? To determine this, you should ask yourself what purpose a new wall unit should serve in your home. This will help you decide the unit option that’s best for you. Purchasing Wall Units in Toronto – Is This the Right Choice for Your Home? When deciding if a new wall unit is right for you, you’ll need to think about the improvements you desire for your home. Are the modifications needed in order to improve interior design elements, functionality, or both? Let’s look at some scenarios that may warrant the addition of wall units in your Toronto home. The Addition of a Media Centre: Is your living room cluttered with media devices such as cable boxes, wires and remote controls? Our interaction with the media and media devices is constant today. It plays a huge part in entertainment, education and current events. There are countless devices such as televisions, stereos, speakers and even home theatres that can be gracefully incorporated into a wall unit. Those unsightly items that are cluttering your living or entertainment room can be discretely hidden and displayed by incorporating a stylish wall unit. Extra Storage: We don’t realize it, but walls are a great way to utilize space. If you need extra storage for things like linens, household supplies, cookware or items in your garage, a wall unit can provide extra space where you didn’t think possible. If you find yourself searching for storage space, a wall unit could be added to virtually any room in your home, providing a quick solution to your storage needs. Home Library: You have a large collection of books that are sitting in boxes or randomly stored throughout your home in Toronto. 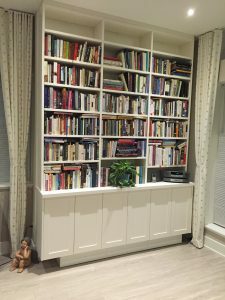 Wall Units are a great way to transform a blank wall into a home library. A home library adds a classy look to a living room or home office while providing an organized way to catalogue and store your books. No more digging through boxes to find the book you need. Art and Family Photos: A wall unit is a great way to display artwork, family photos and family heirlooms. If your family photos and artwork have no place to go, a wall unit will provide an elegant way to display them and will only add to the interior design of your home. This will allow you to fully appreciate the artwork and photos that are special to you. If any of these situations apply to you, a wall unit may be the right option. Walls units are more than just extra shelving. They can be incorporated with the interior design of your home in mind and provide a number a functions depending on your needs. If you’re looking to make some changes to your home, there’s probably a long list of home improvements that you’ve been thinking about for a while but have never quite gotten around to doing. The best home improvements improve your living space both functionally and aesthetically and a custom closet certainly ticks both of those boxes. Different to many other pieces of furniture found in the average home, closets are actually a relatively permanent feature that is affixed to your property, and can reflect your personality and tastes. 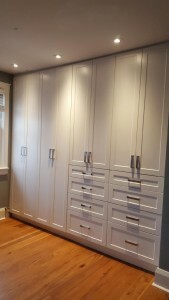 Superior Closets has been designing, manufacturing and installing custom closets of the highest quality in residences across Toronto since 1991 and our team is passionate about providing the best storage solutions around. If you’re thinking of investing in a custom closet there are many factors that you need to consider, some of which we are going to discuss below. The Size of the Closet – How big does your custom closet need to be? In order to determine this you also need to take a look at other design features that are located in the surrounding area. You need to ensure the presence of a custom closet won’t inhibit other features of your home and that it will be easy to access. 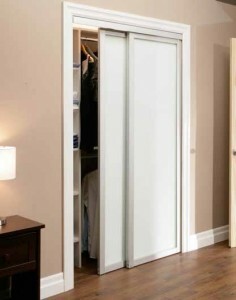 When thinking about the size of custom closets you also need to consider what is going to be stored inside the closet. What Will it Be Made From? – You’ll soon come to realise that custom closets do require a greater upfront investment than standard closets, but this is because the materials they are constructed from are of superior quality (meaning they not only look and feel better, but they will also last longer too). Consider what types of material with fit in with the room’s general theme best. Would it be better to opt for a classic hardwood or would the more modern combination of aluminum and glass sit better? Choose the Doors Carefully – Many people focus too much on what’s inside the closet and not on what’s outside. The doors to your new custom closet are what will be seen most, since when you’re not using the closet they will (or at least should be) closed. The team at Superior Closets can help to ensure the doors you select fit the closet perfectly, and we can also help you to select a design that suits the existing decor in the room, such as the flooring material, the paint and other design features. The Layout of Your Closets – Everyone works in a slightly different way and you no doubt have your own preferences with regards to how you store your belongings. You also might need more frequent access to some types of items that will be stored in the closet. During our free onsite consultation we will try and obtain as much information from you with regards to how the closet will be used and then combine that with the floor plan of the room to come up with the perfect design. The other major factor to consider is cost. Everyone has their own budget and it’s important to come up with one that is realistic for your situation and then stick to it. Superior Closets will deliver the best possible custom closets for the money you can afford to spend and would be happy to discuss your requirements with you today. We also manufacture custom cabinets and walk-in closets, and can be contacted on 905-669-8280 or 1-800-670-8666.